Metro Super Adjustable Preconfigured Units come in all sizes and finishes from chrome, brite and galvanized, to Metroseal with Microban and stainless steel. Because they hold 800# per level up to 4′ wide, Metro Shelving can handle any task. Furthermore, Metro Super Adjustable Preconfigured Units are the most advanced and innovative wire storage system available. Because a unique corner release system and SiteSelect Posts make changing shelf levels fast and easy without tools! 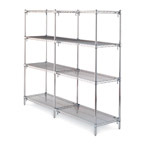 Additionally, Super Adjustable Shelving works in conjunction with the entire Super Erecta System of shelves and accessories. •Strong design: up to 800lb. (363kg) evenly distributed per shelf. •Quick adjustment at 1-inch (25mm) intervals. •Easily configurable for stationary or mobile applications. Metro Super Adjustable Preconfigured Units come in all sizes and finishes from chrome, brite and galvanized, to Metroseal with Microban and stainless steel. Because they hold 800# per level up to 4' wide, Metro Shelving can handle any task. Furthermore, Metro Super Adjustable Preconfigured Units are the most advanced and innovative wire storage system available. Because a unique corner release system and SiteSelect Posts make changing shelf levels fast and easy without tools! Additionally, Super Adjustable Shelving works in conjunction with the entire Super Erecta System of shelves and accessories. •Finishes/Materials: Type 304 Stainless Steel, Metroseal 3 epoxy coated, Chrome •Strong design: up to 800lb. (363kg) evenly distributed per shelf. •Quick adjustment at 1-inch (25mm) intervals. •Easily configurable for stationary or mobile applications.